This photo was recently posted to a Facebook paranormal interest group to which I belong. The original poster did not post any accompanying information on the photo, and as of 16 hours after the original posting, had not returned to answer any questions or pose any type of clarification. When I'm perusing Facebook groups, I tend not to focus too much on the ghost pictures submitted by others. Most often, its just not worth it, lol. That sounds harsh, but its true. Either there is just not enough information or photo clarity to give a good, accurate analysis....or the photo is a natural glitch. Sometimes, the photo is outright fraudulent. These I hate the most because I'm one of those who believe that people are inherently good. I don't think the majority of people posting ghost app photos and other fraudulent photos and/or information are doing so maliciously. Rather, I think people have a tendency to find something cool on the internet and want to share. Unfortunately, some are the victims of pranks by friends who realize their gullibility. I tend to think this photo is just one of those, 'Hey, cool! Look what I found!' photos. When I first scrolled by and paused, what caught my attention was that I knew I had seen this image somewhere before. Further, while looking at the photo, it certainly didn't look like an image taken with a camera---it had that look of 'film,' like it was a still shot from a movie. A simple reverse-image search later, and I had my answer. 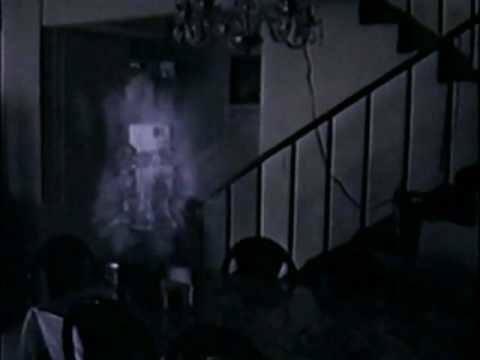 This image IS a still shot, and it was probably taken directly from the documentary, The Best Ghost Cases Ever Caught on Tape, which aired as a Fox TV special in the early 2000s. This show specializes in taking film footage of alleged ghosts, and explaining or debunking them. While I highly recommend watching the whole thing, I want to bring your attention to the clip at hand. If you fast forward to 26:16, you'll see the clip in question....and the confession that it is the product of a student filmmaker! Oh, and what looks like a robot ghost is actually the mist pausing in front of the refrigerator, lol.